The latest incarnation of the long-running Boeing 737 line are the -800 and -900 models. These aircraft incorporate all the latest innovations including glass cockpits and uprated engines with the pseudo-triangular intakes that were used on the -300 model some 15 years ago. Delta Airlines was one of the last holdouts in what seems like an annual change of liveries. Their older and quite nice livery lasted 35 years before someone decided that a change of look was needed. Now whether you like the look or not, it is clean, and still incorporates much of the styling of the older livery. Delta has decided to concentrate on just a few aircraft types and is in the process of purchasing a huge number of new aircraft. The 737-800 has been chosen as their standard for a short-medium range aircraft. This will replace Delta's large 727 fleet as well as the older 737-300, eventually. 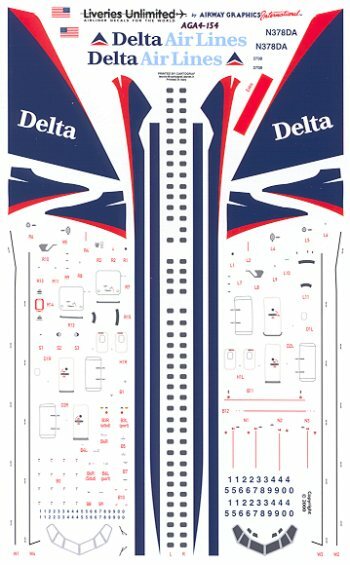 Liveries Unlimited's new 1/144 sheet is all that you have come to expect from this now-premiere maker of airliner decal sheets. Registration is spot on, the decals are crisp and finely detailed. Also included, but not shown is a wing emergency exit decal. Though N378DA is the aircraft on the instructions, there are sufficient registration numbers for any of Delta's planes from N371DA on up to be represented. There are also spare fleet serials included for the nose and tail. An extensive painting guide is given on the back of the decal placement sheet so that you will have no problems painting your aircraft. As usual the notes section is informative and helpful. Like most modern airliners, this one is white and grey and natural metal. Just a note. The decal sheet background is really light blue, but it scanned as white. Don't want you to think that LU is using poor quality Korean decal paper!! 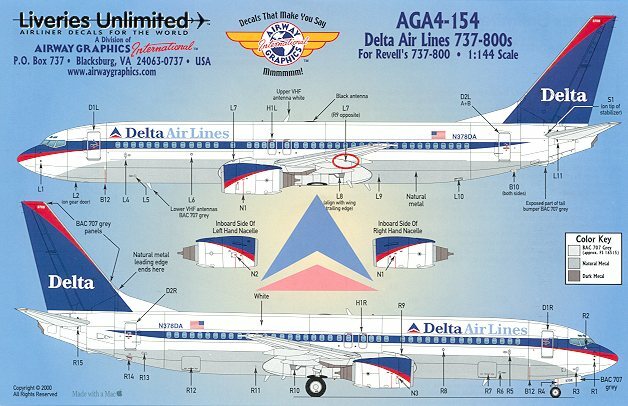 Another super sheet from Liveries Unlimited, and highly recommended for airliner modelers. Review copy courtesy Liveries Unlimited . If you can't find their decals at your local hobby shop, you can order them direct from the link above.